Quebec City is always such a great place for ship lovers. It’s a bustling port, with lots of action to admire, and neat iron plying about. Today, I had the opportunity to visit some berth mates before I signed off, here are some pictures. River traffic is constant, above is Umiak 1 leaving for its monthly trip to northern Quebec, with supplies for the mines; then coming back loaded with valuable nickle ore, for transhipment from Quebec City. 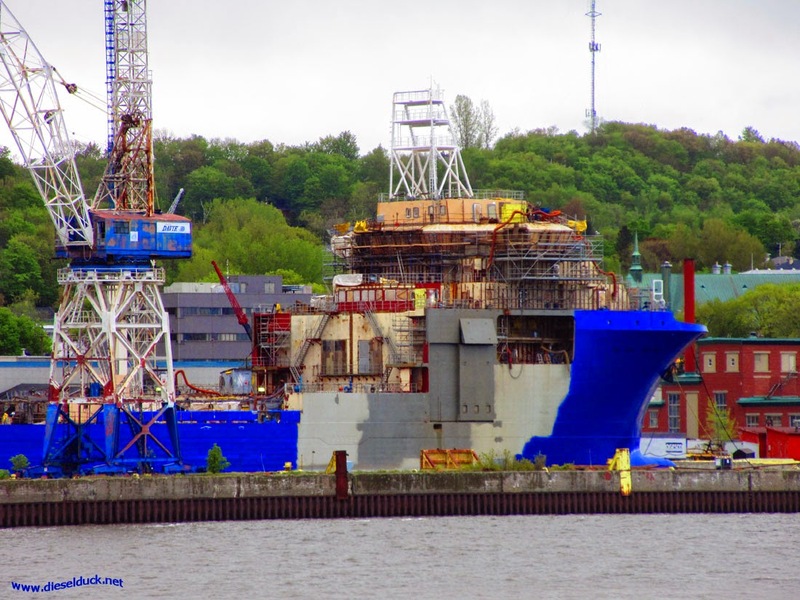 In the background is Davie Yard, where the fitting out of the second of three Cecon ships is well under way. Unseen, but on the ways, is the third sample of the offshore construction ship, and the beginnings of one of the new LNG powered ferries for Society Traversier de Quebec (STQ). main website. 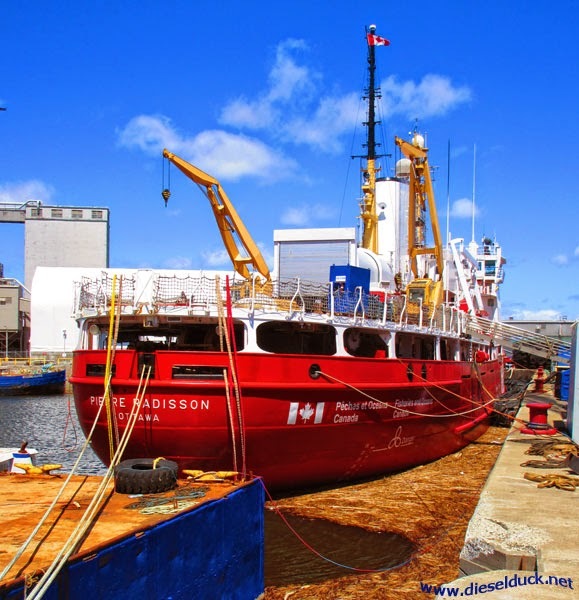 Coriolis II (above left) is the ex Coast Guard Ship John Jacobson, from the West Coast, its sister ship is the CCGS Gordon Reid. They are fueling the ship, in preparation for departure. Getting under, below, to its homeport in Rimouski, further down the river. Groupe Ocean is getting to be a massive player in the ship repair, harbour tugs, shipyard, dredging and various other activities. Quebec City is the home base for the company, and its it pretty clear they have quite a few projects on the go. The CCGS Pierre Radisson is one of Ocean’s project with some steelwork and machining being done, before the ship head into the arctic in a couple months. 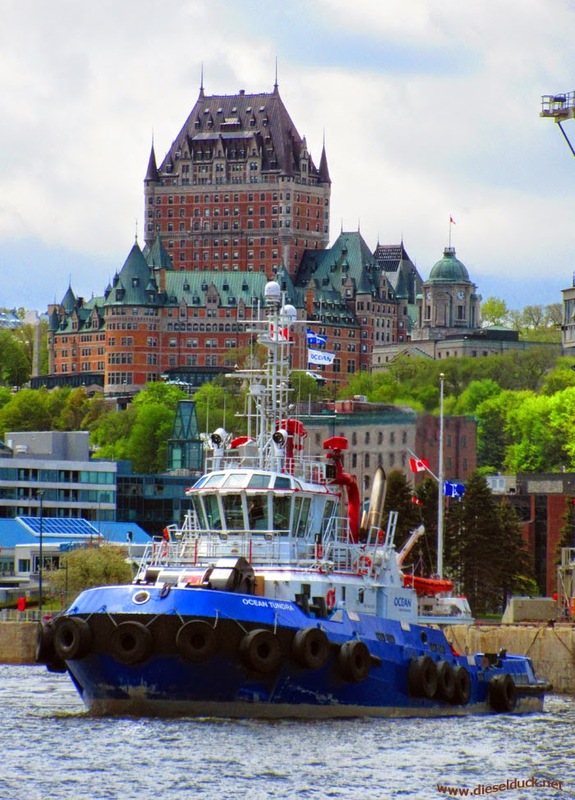 The Ocean Tundra strikes a pose, with the iconic Chateaux Frontenac in the background. 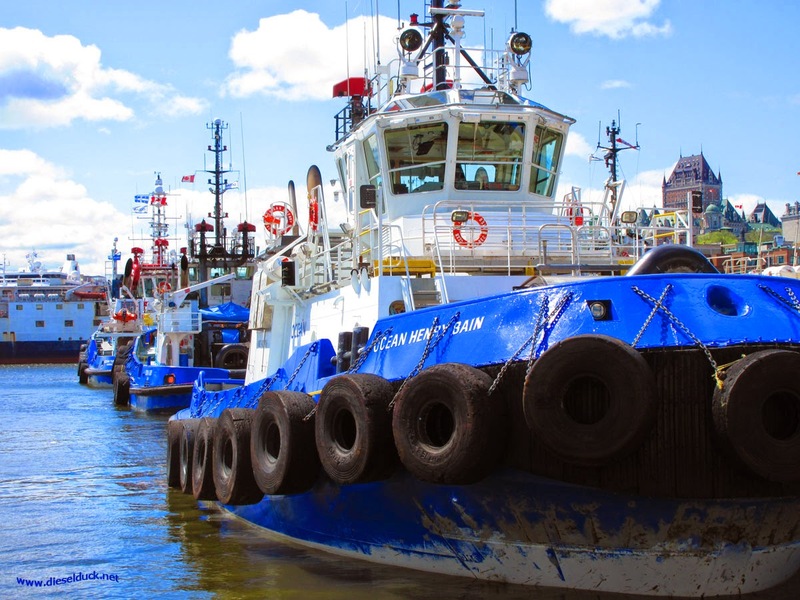 The Robert Allan designed tug was built at Ocean Industries in nearby Iles aux Coudres shipyard. The MaK powered tug is currently the most powerful tug in Canada at 8,160 hp, and a sister, the Ocean Taiga, is currently under construction. 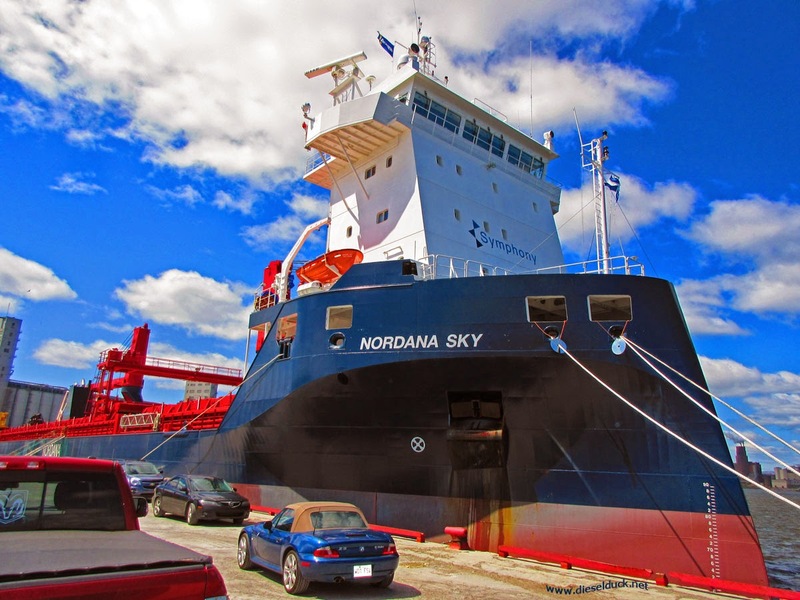 The newly built, and flying the Canadian flag, Nordana Sky, owned by Symphony Shipping is under charter to Desgagnes, to replace the retiring Catherine Desgagnes. I’d say its quite a jump to this new ship, launched in February 2015. Here are more details from the builder and below is a video of her launch. 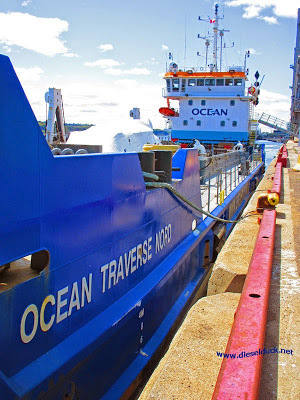 The newish Ocean Traverse Nord was built at Ocean Industries in Iles aux Coudres, in 2012. 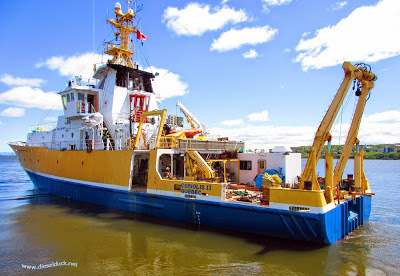 It is a Trailing Suction Split Hopper dredge; it has just returned to Canada, from working in the Caribbean. When full, the hull splits open allowing the dredge tailings to clear out quickly, its quite a sight. Some of Groupe Oceans other modern tugs, at the company’s berth in the Louise Bassin. They are used principally for ship docking at the nearby Ultramare (Valero) refinery in Levi, across the St Lawrence River from Quebec. Ocean Henry Bain, in front, the Ocean K Rusby, in the middle, and the Ocean Tundra at the back. 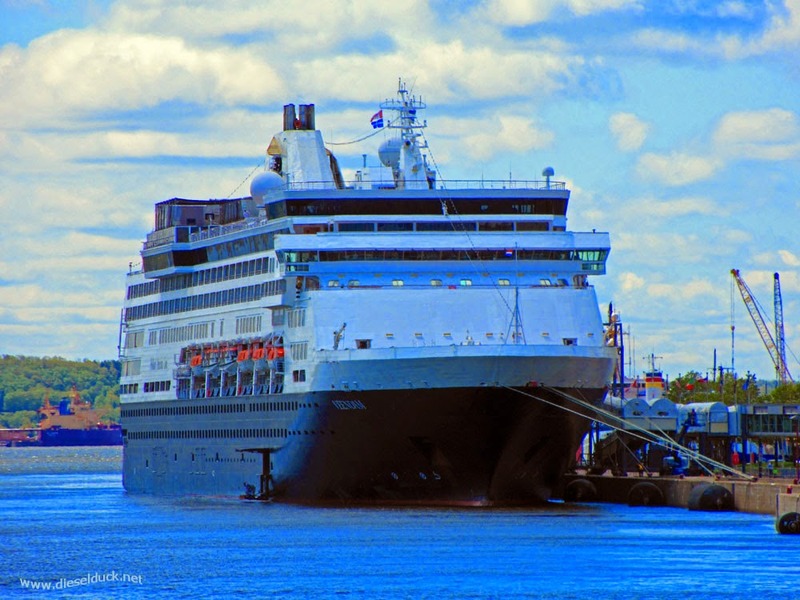 In the summer time, there is always a cruise ship, or two, in town; Holland America’s Veendam spent the night, at the cruise terminal, right in the heart of Old Quebec. Always lots to see at the Port, you can browse the arrivals and departure at the Port de Quebec’s website, here. Thanks for the info. Your blog is good and awesome. Here's my input get best Ship Engine parts http://www.hohyunic.com. Check this it will helpful for you.